Show, Don't Tell is a writing technique where in actions speak louder than words. It's a technique that is often used for works that are meant to be open for interpretation. The creator of Haibane Renmei; Yoshitoshi ABe, loves using this technique. He's used it in Serial Experiments Lain and he's also used it in this anime. If you've watched Serial Experiments Lain then you might know how confusing is is. Haibane Renmei is a show that does not cater to everyone's taste. Like ABe's Serial Experiments Lain, It is a show that is truthfully difficult to recommend to people simply because of its style of writing. It doesn't really stand as one particular genre because of its atmosphere and the only way you can truly enjoy this anime is if you appreciate the atmosphere which it has. 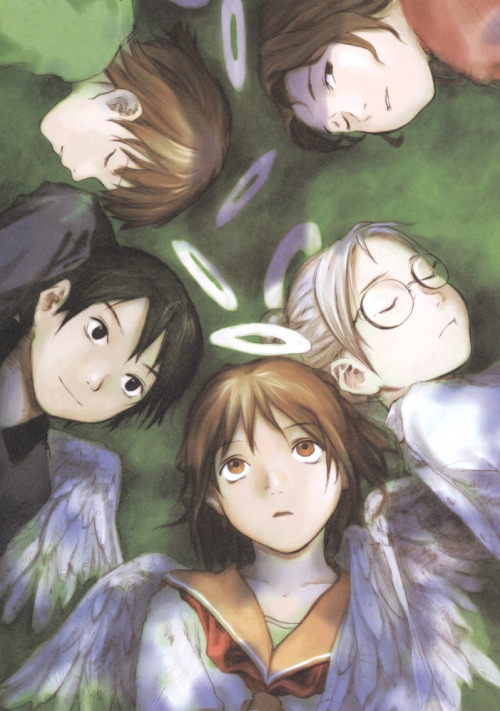 Haibane Renmei is a story that is shown through the eyes of an angel-looking (Haibane) female character named Rakka. Like many other Haibanes, Rakka was born into the world without any past memories except for a dream. As Rakka becomes accustomed to her life, she starts gaining friends and learns about the town. It is a town that is confined by a wall which only a certain group of people known as the Toga can exit. As the anime progresses, Rakka starts having existential questions and the plot starts focusing more on a friend of Rakka named Reki. Haibane Renmei is an adaption of a Dōjinshi made by Yoshitoshi ABe. Don't get the wrong idea though because there is nothing sexual about the content. Not all Dōjins are sexual, they're just works that are often made by amateurs. Haibane Renmei is an anime that is relaxing. It is difficult to recommend to anyone because It's not an action-packed angels vs demons action-drama and neither is it a cliché slice of life or mystery. It's the type of show that you can slouch back to or maybe even fall asleep to because of its subtlety. What Haibane Renmei does is that it ask existential questions, but it never answers them by the end of the series. It just leaves things open for interpretation. Many people will end this series disappointed by the fact that many questions were left unanswered, but in my opinion, that ambiguity is what gives this anime beauty. Whenever characters question each other about existential things, they just respond by saying that they do not know or that it's just simply meant to be. These Haibanes question such things while they live out their daily lives, but the end of the series shows that they just simply do not have answers and will go on continuing their normal lives. Like us, there are existential questions that we want answers to, but we just cannot answer them. Whilst it may be like a slice of life, Haibane Renmei is also a story of coming to terms with one's self and by the end of the series, it has stayed true to the type of story that it is. It's a story that is meant to be shown, and not told through heavy-handed explanations and monologues. It's a technique that allows the viewers to interpret the story and it is also a technique that is underappreciated. Haibane Renmei's soundtrack is beautiful. It fits the mood of the anime nicely and it really brings out the atmosphere and setting. There are scenes in this anime that come off as powerful because it immerses you in its world through the use of music. Much of the music is calm and light even in the most dramatic of scenes, but it never allows itself to completely take over because it just simply serves its function wonderfully. I also think that they did a fantastic job with the OP and ED because they compliment the type of show that Haibane Renmei is. When it comes to visuals, Haibane Renmei can be seen by some as off-putting. This is because the anime was made in 2002 and the visuals have an old feeling to them. Sure it does look old, but to be honest, this actually works to the advantage of Haibane Renmei because it is the type of show that gives off an old, warm and relaxing feeling. The art is made for that purpose and it compliments it well. The old feeling is generated by the fact that everything is shown using a soft and muted earthy color palette. The atmosphere and setting have a vibe of mysticism to them while the character designs are not to moe, just simplistic. The facial languages and character movements were also done pretty well in some scenes. Haibane Renmei takes advantage of the fact that Rakka was born into a new world and that she had to get accustomed to living. The first few episodes focus, particularly on each individual character. We are not only shown how these Haibanes go through their daily lives, but we also get glimpses of what their world is like. This not only helps us know some details about the characters, but it also makes for an effective world building. The real highlight though is the character interactions and struggles of Reki. The character interactions bring out a theme of friendship and the characters themselves feel like they're a family which highlights the power of friendship. The struggles of Reki are not resolved through stereotypical ways wherein they snap out of something through the encouragement of a friend. It is resolved through the acknowledgment of the fact that it is about coming to terms with one's self.